Pick one that you want from our New Litters screen. Call for our most current information. Email Roxy at roxysragdollkittens@gmail.com or call us by using the information on our Contact Us page. 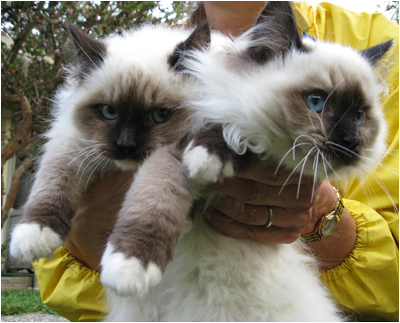 We will set up a time to meet, and make sure that a Ragdoll kitten is a good match for you. We accept deposits for your Ragdoll kitten choice. Once paid in full, you can bring home your newest, cutest addition to your family! The adoption price of the cats (as of Jan. 2015) is a total of $1200. This fee includes the vet check and first shots. You can also send a $200 deposit to put a hold on the kitten of your dreams! (Which will go towards paying the total adoption fee).